Doggie Beer Bones Giveaway Winner! The thing about being at home for two weeks is that I was dying to spend some time outdoors. 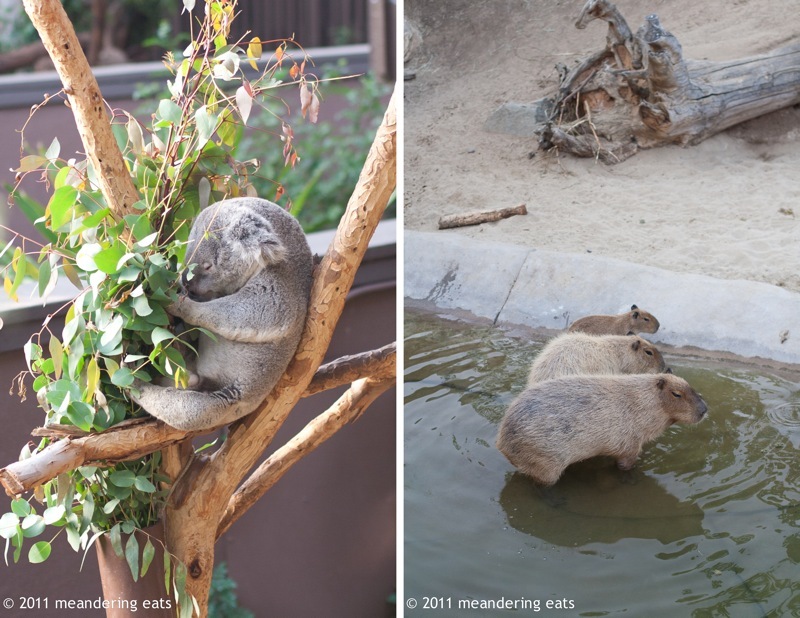 Dan suggested a walk through San Diego Zoo in the evening, during their Nighttime Zoo hours. The zoo's only open in the evening during the summer and it's a wonderful walk. We stayed until the zoo closed, then looked for a late dinner. After some debate, we settled on trying Yu Me Ya Sake House in Hillcrest. We had a lovely dinner and that was further evidenced by the fact that, a week later, Dan suggested we return. That's an endorsement if I've ever heard one, since he usually has to be cajoled into trying new restaurants and usually requires a couple of visits before he warms up to it enough to add it to the rotation. The restaurant is tiny, with a few tables and seats along a long bar. It's warmly decorated and has a cozy ambiance for dinner for two or dinner with a small group of friends. 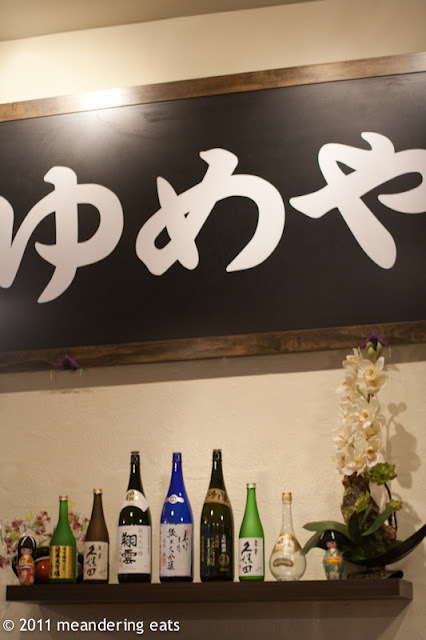 We aren't huge sake fans, but Yu Me Ya offers sake tastings along with an extensive sake menu. 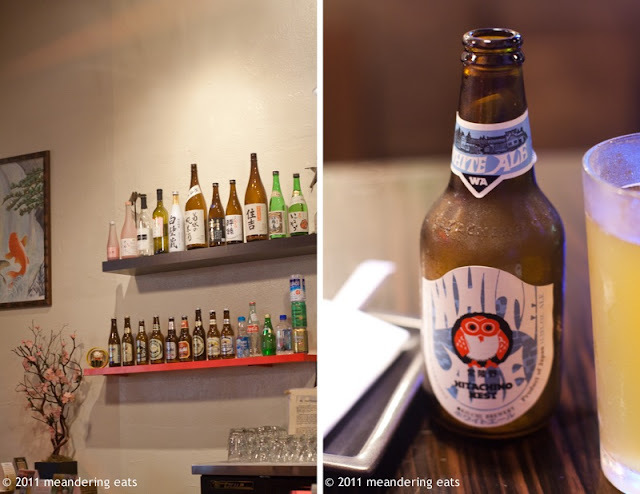 Instead, we had Japanese microbrews with our dinner. My Hitachino Nest White Ale was light and floral, making it a refreshing choice after a long walk during a warm evening. 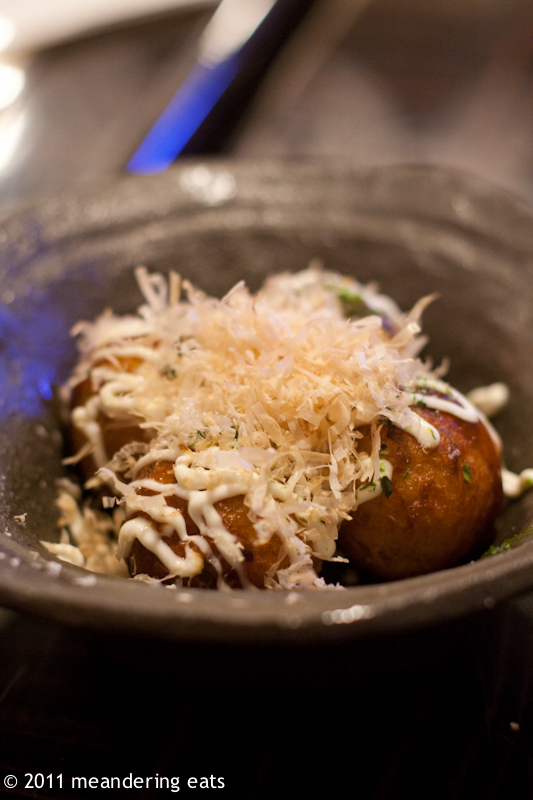 I loved the takoyaki, fried balls of breaded octopus. The crust was perfectly crispy, the interior tender, and the octopus with just the right amount of chew. I also loved the topping of bonito flakes, which are shavings of dried fish and they're nice and salty. 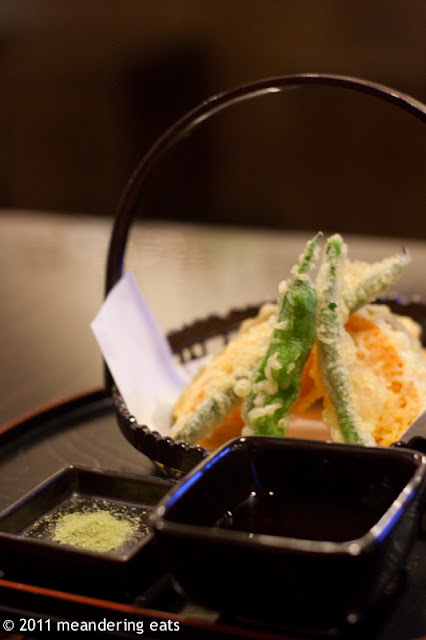 We love tempura and it's perfect here. The breading is light and crispy over tender veggies and shrimp. They were served with a matcha (green tea) salt and we weren't sure what to expect, but it was a wonderful pairing with the fried tempura. 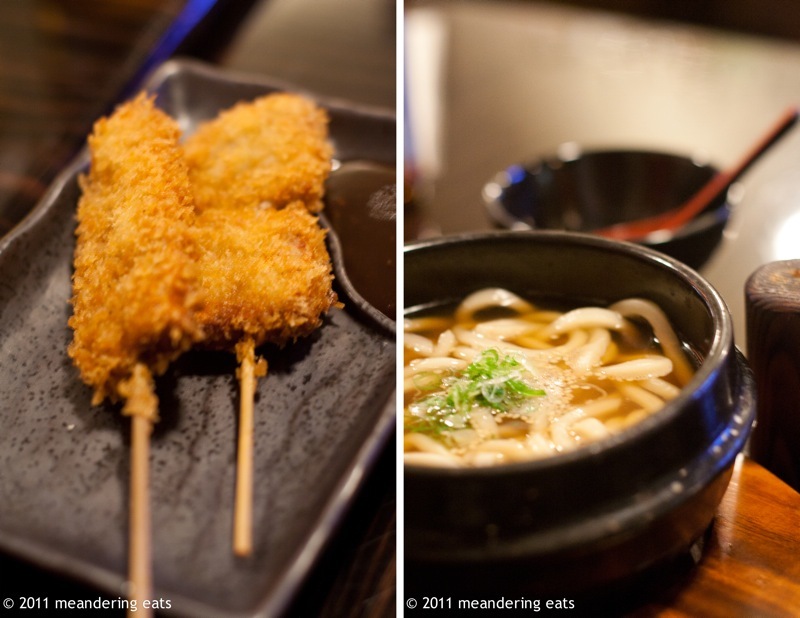 There was the pork tenderloin kushikatsu, which was medallions of tenderloin breaded, fried, and skewered. It was perfectly fried and the pork was tender, but it did lack a little flavor. On our second visit, we tried it with squid and I thought that was much better. On the other hand, the udon was a complete winner. In fact, I would go to Yu Me Ya just for a bowl of udon and a beer. The noodles were hand-pulled and had the perfect amount of chew. We ordered the "plain" udon, which was served in a simple shoyu (soy sauce) broth. The broth was flavorful and the whole dish was unforgettable. Since most of our dishes were fried, we had to make some semblance of an attempt to eat healthy, so we ordered an eggplant dish that was served with a sweet miso-based sauce. Eggplant is difficult to prepare, because it's so full of water that the water is either removed via salting or the eggplant has to be seared/fried at a high temperature to seal it in. If it fails, then you get a bowl of mush. Worry not, because the folks at Yu Me Ya know how to cook eggplant. It was perfectly cooked and the sauce was drizzled lightly on top. This is their second location, with the first being in Encinitas. I haven't had a chance to visit, but I hear the lines are long. While I hope the Hillcrest location becomes as popular, I'm glad I don't have to wait long for a table and it's close to home. It was one of those meals we thought about for a while. We've already been back, but of course, we'll be back again. How did you get that shot of the wombat-y animals all standing in a row? So cute! 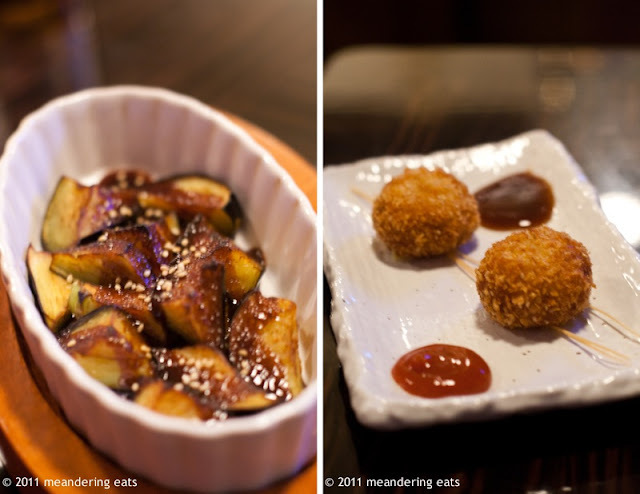 Every single one of those dishes at Yu Me Ya looks fantastic. Especially the eggplant and the udon (T is a sucker for good udon). *sigh* Add it to the list! Been to the Encinitas location but still yet to check the Hillcrest location out. Too bad they're not open for lunch. Food looks great! ooh, aren't those capybaras!!!! the world's largest rodent from south america?!!!!!! Marsupials! Very cute. And your meal looks so good. Hehe, fried balls of breaded octopus, can't help but to giggle when I say it but it does sound really good! Yup, that's what they are! I was just clicking away and lucked out... the little one stuck close to the other two, so it worked really well for me!